Black and white image of a couple standing next to a car, with two men sitting in the front of the car. The road is dirt, though a fence borders one side, and appears to run through a wooded area. This location is near the intersection of Laidlaw and Kaizer Roads and the newly renamed Tualatin Hills Parks and Recreation District's Hansen Ridge Park. 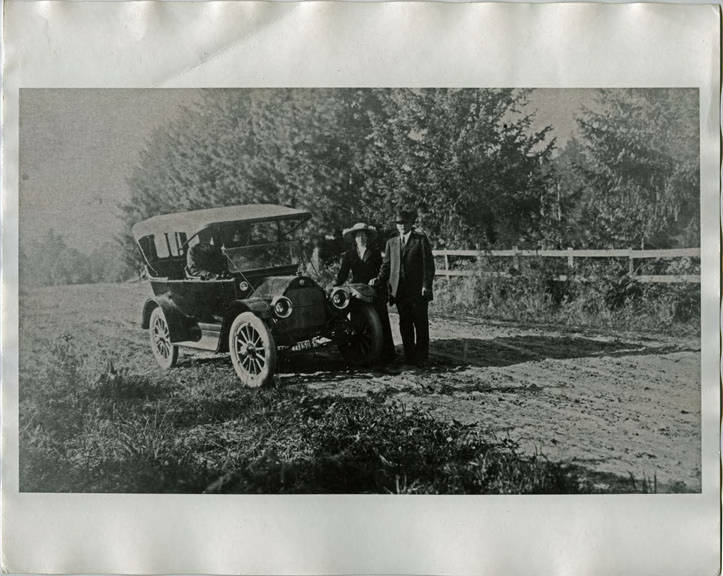 According to museum records, the man driving is Henry Hamel, while the couple standing beside the car are Gus and Freda Erickson, Hamel's relatives. The REO Motor Car Company was one of the first to mass-produce automobiles in the United States, though it discontinued its automobile manufacturing to focus on trucks after 1936. They are most famous for their precursor to today's pickup trucks, the REO Speed Wagon light delivery truck.